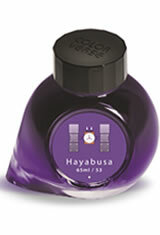 The Colorverse Tokyo Hayabusa Special Edition fountain pen ink comes in a two bottle pack. Both bottles are the same dye based purple fountain pen ink but the smaller 15ml bottle has gold glistening particles. This purple fountain pen ink has the Pantone Violet U and an RGB value of 119 88 179. The ink also has a slight sheen characteristic on certain papers. The Colorverse Tokyo 2018 Hayabusa SE(65ml + 15ml) Fountain Pen Ink usually ships within 1 business day unless otherwise specified. Each Colorverse Tokyo 2018 Hayabusa SE(65ml + 15ml) Fountain Pen Ink we sell is guaranteed to be genuine, authentic and will arrive brand new & unused! Is the 15ml bottle Hayabusa Glistening or just a second bottle of Hayabusa without the shimmer? Other vendors list this combo as Hayabusa + Hayabusa Glistening. Thank you. Yes, it the smaller bottle is Hayabusa glistening.